Describe how sales process and path are configured in NPSP. Customize a sales process or path. If you haven’t earned your Donation Management with the Nonprofit Success Pack badge yet, complete that module first. It explains a few concepts that we are going to assume you already know. Before we launch in, a key thing to remember about NPSP is that the opportunity object is used to track revenue from fundraising, merchandise sales, memberships, class registrations, etc. Opportunities are revenue solicitations in progress and the object has some special features that help you to track your progress and focus your team’s efforts. Salesforce was originally designed for sales people whose deals typically progress in stages from tentative to firm before they’re finalized. As a deal moves along, the probability of the sale increases and managers use that probability to predict or forecast if they are going to meet their overall sales goals. In a sales context, opportunity sales processes map out the stages an opportunity follows as it progresses through the sales cycle. The stage an opportunity is in affects what’s available for your users to view in the path component (more on path later) as well as filters on list views and reporting. You can set up separate sales processes for each type of “sale” you make. Many nonprofits don’t “sell” in the way a corporation might, but they do solicit donations, request grant funding, or sell tickets, all of which follow their own processes. To that end, NPSP comes pre-configured with four opportunity sales processes custom to nonprofits, including donation, grant, in-kind, and major gift. 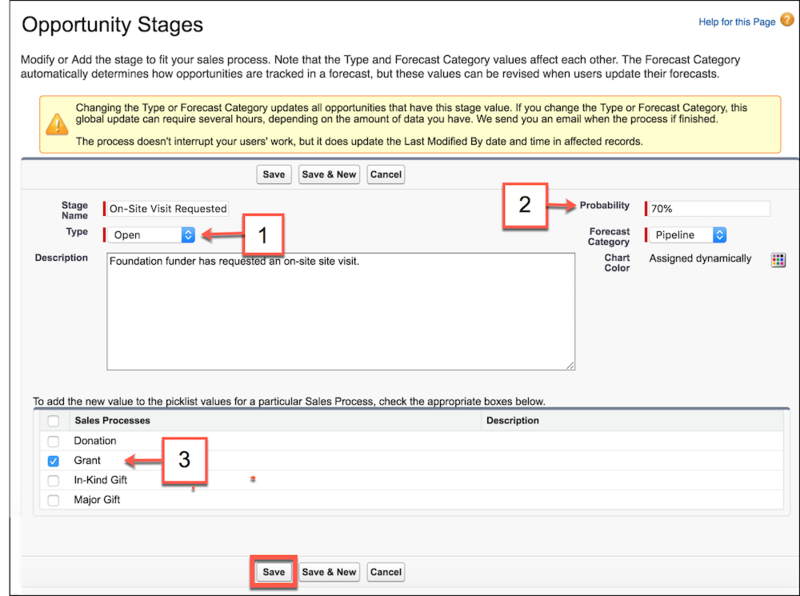 The stage field on an opportunity record describes where you are in the process. And the sales process determines which values are available in the stage picklist for each defined process. This is a grant your organization is exploring or planning to submit in the future. A status of “Open” means that you have not received a commitment from the funder yet. Your organization has submitted a Letter of Intent (a common first step for some funders). You have officially submitted your grant application, but have yet to hear back. You have withdrawn your application. This Opportunity is marked Closed/Lost and can be omitted from pipeline or other reports. Despite your best efforts, the funder has rejected your application for funding. Closed/Lost and can be omitted from pipeline or other reports. The grant has been awarded. It is marked Closed because you have received the commitment from the funder. As you can see, opportunity stages have probabilities associated with them. When you change the stage on an opportunity to posted (or closed), the probability (%) field automatically updates to 100. You can also manually adjust the probability. You might submit an application for a grant, for instance, where conversations with the program officer lead you to believe you have a higher, say 70% chance, of receiving the grant. We recommend that NPSP admins get familiar with each of the four preconfigured sales processes and their stages to understand what those processes are out-of-the-box. From that you can determine if it meets your organizational requirements or if you want to customize or add sales processes. 2. Enter “sales processes” in the quick find box and click the link. 4. 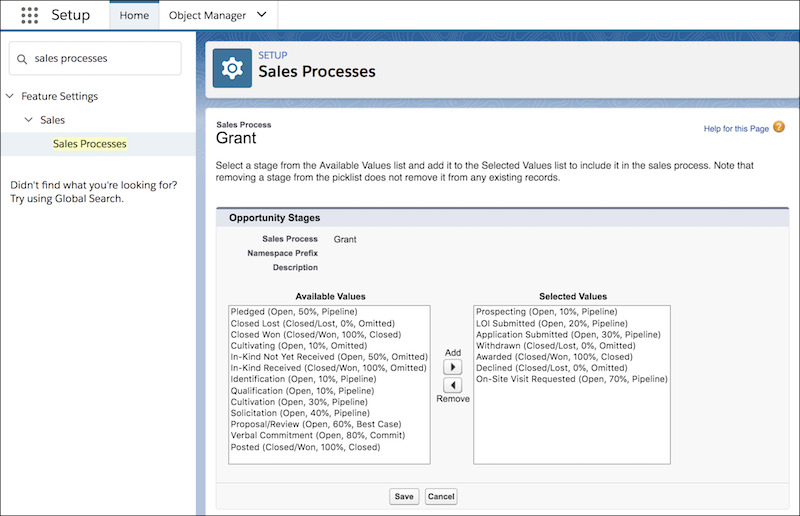 In this view, you can add opportunity stages that already exist or remove stages that were included in this configuration. Removing a stage from the picklist does not remove it from any existing records. 5. Click Save to save any changes or cancel out of this view. When determining which stages you’ll use, bring together some of your key stakeholders across the organization to review the current stages and map out your process. Determine which of the standard stage names to use and whether to add custom stages for your organization. If you customize your stages, make sure that the names are intuitive for the folks who will be using them on a daily basis. And make it an annual practice to revisit your sales process and ensure that your stages are still relevant every fiscal year. 2. Click on Object Manager. 3. Click the Opportunities object. 4. Click Fields & Relationships. 5. Find and select the Stage field. 6. Scroll down to the Stage picklist values section and click New. 7. Add a new value in the stage picklist. In this example, Gorav adds the Stage Name as On-Site Visit Requested. He sets the (1) Stage Type as Open since it is prior to any grant fund being received and he sets the (2) Probability for this stage a bit higher than others since it designates a good amount of interest on the part of the funder. Then he adds this stage to the (3) Grant Sales Process by selecting the appropriate checkbox. Gorav didn’t need to create a new sales process given his requirements, but it would have been easy enough to do that, as well. Check out the resources at the end of this unit for more information on creating a new sales process. We mentioned path briefly, but let's take a minute and review some of its features. A path guides your users with a visual representation of the stages required for working through a process. A path can help users stay focused on important tasks and help your organization with user adoption, as well as data completeness and integrity. Paths show the steps for each defined stage and appear immediately below the object summary information. 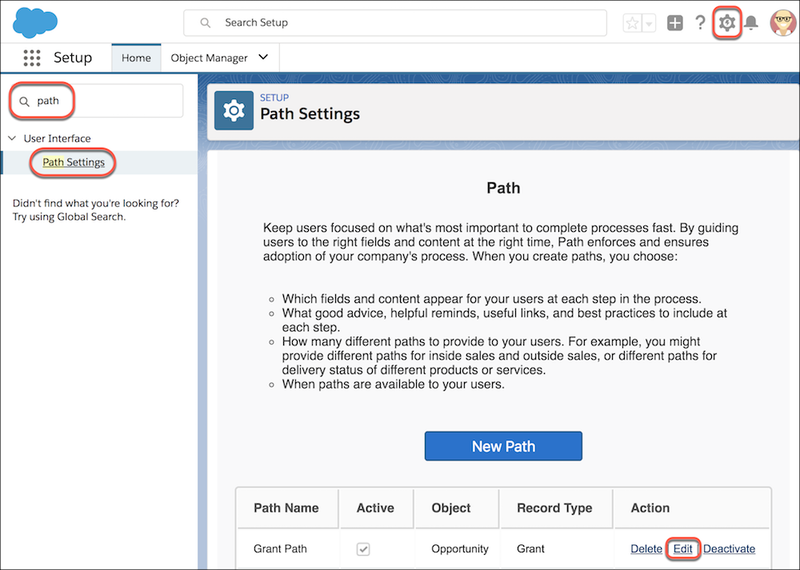 A path can be used on most custom and standard object record detail pages, but we’re going to focus on the opportunity detail page in this unit. Only new trial orgs have path and grant path enabled by default. If you're using an older version, you'll have to enable these features yourself. Gorav has just added a new stage to his grant sales process and now he wants to add some key fields and instructions for his development users. Again, he has worked closely with his development stakeholders to determine how Salesforce can best meet their needs. 2. Enter “path” in the setup quick find box. 4. Scroll down to the path you want to customize and click Edit. In this case, we are going to edit the Grant Path. This is also where you can create a New Path if you need to. 5. The first page in the path settings wizard allows you to change the Path Name and fields that your path references. In this case, we are leaving those settings alone, so Gorav moves to the next page where he can edit fields and text. 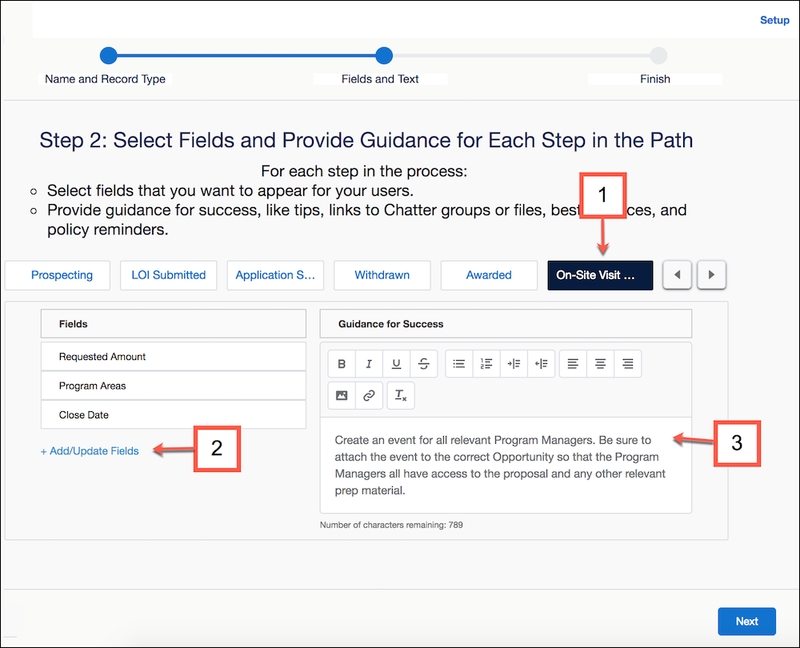 On this page, he selects his new (1) On-Site Visit stage and updates the (2) key Fields, and (3) creates guidance for his team. He can even add links to other documents or best practices right in the guidance section. 7. Select Active or Inactive to set the status of your path. This path is already Active, so Gorav leaves it that way. Pretty nifty, right? You’re now well on your way to becoming an awesome admin! Now we are going to jump into some key NPSP donation management settings that are really going to make you a hero at your organization.